I follow the maxim, everything in moderation is good for you. This is why I bake so much! I also bake so often as at present Dave’s son comes to visit us on most Sunday’s, with his girlfriend, and a treat is always appreciated. I have baked using fructose for over 20 years now, with no ill side affects. My body battles to process sucrose and so this is the substitute of choice for me in my kitchen. Fructose is a fruit sugar and this monosaccharide is absorbed directly into the bloodstream during digestion. Fructose exists in honey, fruits, flower, berries and root vegetables. When I say fructose, I am not talking about high fructose corn syrup which is a mixture of glucose and fructose. Rather I am referring to a solid product that resembles fine sugar. In my recipes I use the word sugar to refer to sucrose. As with fructose, sugar is sourced from sugar cane and sugar beets. Sucrose is a disaccharide made from combining glucose and fructose. Personally I would recommend that whatever you use, make sure it is in moderation. Allow yourself treats, and if you are looking for something to make this weekend, then my recipe for lime and ricotta cheesecake should tick all the boxes for you. Dave and I are overseas in France. I will be back in my office on the 6th of May and I will start replying to comments then. I won’t be able to read any blogs while we are away so please forgive my lack of visiting back. To follow along with us, click here. I absolutely love cheesecake but I haven’t made it in awhile. I definitely have to try out this recipe. Thanks for this Tandy :). mmmmm zesty goodness I’m sure Tandy! Love the look of this Tandy and we have good some fabulous ricotta at work that would be perfect. I love that this is a thin cheesecake. Oh my gawsh – lime and ricotta in cheesecake??? You are killing me Tandy!!! Wheres’ my piece??? I agree that everything in moderation is good! These cheesecake sounds delicious – citrusy and creamy at the same time. Great combination of flavors – this cheesecake looks terrific. I was wondering why you always used fructose in your recipes but never asked before! Thanks for enlightening me. No surprise you’re making a lime dessert! I love lime desserts after a big meal, they are so refreshing. 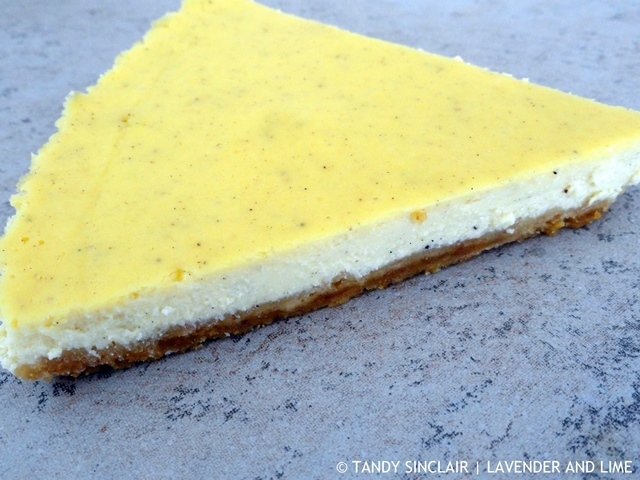 I love this sweet tart twist on cheesecake! Beautiful – love the fresh flavours! Could go a slice of your cheesecake about now with a nice cuppa.